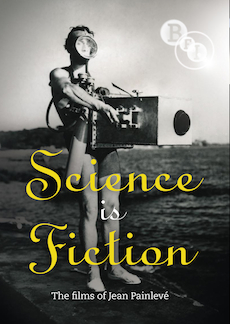 Two-disc set featuring a selection from 50 years of passionate scientific enquiry by Jean Painlevé, poetic pioneer of science films. Before David Attenborough and Jacques Cousteau – there was Jean Painlevé. Poetic pioneer of science films, Painlevé explored a twilight realm of vampire bats, seahorses, octopi, and liquid crystals. In collaboration with his life-partner, Genevieve Hamon, Painlevé made more than 200 science and nature films and was an early champion of the genre. This selection from 50 years of passionate scientific enquiry includes his most famous films – The Sea Horse, The Vampire, The Love Life of the Octopus and Sea Urchins – with their often-amazing music, which ranges from Duke Ellington to the French pioneer of electronic music, Pierre Henry. Possessing a remarkable eye for life's eerie curiosities, Painlevé's art pivots on the premise that "science is fiction". He created a landscape of bug-eyed wonderment marked by a playful sense of nature's hidden poetry and scandalised the scientific world with a cinema designed to entertain as well as edify. In the process he won over the circle of surrealists and avant-gardists and counted amongst his friends Antonin Artaud, Sergei Eisenstein, Jean Vigo, and Luis Buñuel. Painlevé's astonishing documentaries witness a genuinely 'magic realism', which continues to enchant audiences around the world. A two-disc set in a double-cover digipack, the DVD release also includes The Sounds of Science, an exclusive extra disc featuring an alternative soundtrack by US art-rock band Yo La Tengo to a selection of the films. Yo La Tengo's place in rock history is unique – few bands in memory dare to experiment quite so widely with such casual audacity. From screeching art-rock and jangling pop songs to electronic soundscapes and hushed lullabies, their music explores the range of musical history without ever sounding less than modern. In 2001 the band was selected by the San Francisco International Film Festival committee to compose new music for the films of Jean Painlevé. Their alternately sombre and joyously moody music seemed like a natural fit for Painlevé's dramatic underwater studies. Filmed introduction by academic Dr Michael Abecassis. Two short films by Percy Smith – The Birth of a Flower (1910), and The Strength and Agility of Insects (1911).